"I’m not trying to navigate politics, and the tech which is keeping me alive isn’t slipping out of my grasp." In Now Playing articles PC Gamer writers talk about the game currently dominating their spare time. Today Pip grapples with existential questions. 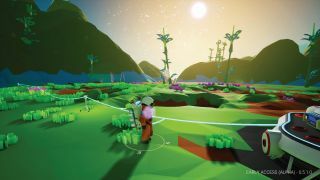 Until this week, my most recent conversation about Astroneer involved bumping into former lead designer Jacob Liechty at GDC in San Francisco. He was in the process of leaving the company and we had a fascinating chat about his new work in AI safety. Playing Astroneer roughly a year on, that chat came back to me. I meant to check in with the game’s progress and fiddle around with multiplayer. What I ended up doing was listening to a 2015 episode of The Partially Examined Life—a philosophy podcast—featuring Nick Bostrom. Bostrom is the director of the Future of Humanity Institute at the University of Oxford. I came across his work when I used to write for Wired because questions of existence and existential risk sit alongside areas of rapid change (like AI) and can feed into how we alter legislation. These questions are a valuable part of how we grapple with an unknowable future and our own culpability or control. Depending on whether you believe in the Singularity they might be the most important questions we face today. But the conversation can become paralysing—it invokes an inconceivable level of change brought about by people and tech over which you likely have no control. Pottering around in Astroneer’s optimistic future makes those questions easier to contemplate. It helps switch off that vast shadowy powerlessness which threatens to overwhelm the topic after a while. Right now there’s a discussion of existential risk playing in my ears. But it’s balanced by my hands being plunged into Astroneer’s peaceful future where we figured this all out. In Astroneer, for example, there are no think pieces about the destruction I may be wreaking on the ecosystem, I’m not trying to navigate politics, and the tech which is keeping me alive isn’t slipping out of my grasp. There’s a wiki if I can’t remember what a filter does, for goodness sake. I have a functional base and a backlog of mysterious lumps which I can analyse to generate data. If I accumulate enough data, I can acquire blueprints for crafting and exploration options. I’m torn between a pursuit of the shuttle which I can use to reach new planets, or investing in rovers so I can scoot around.